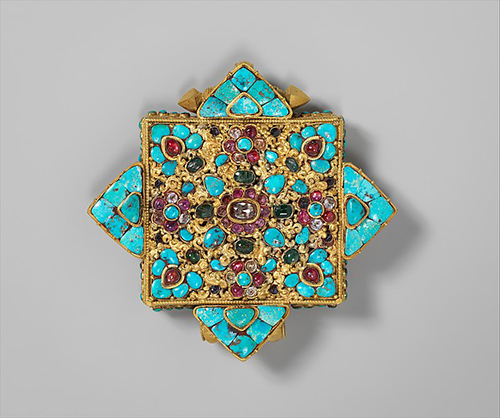 The charm box pendant called the ga’u originated in Tibet. 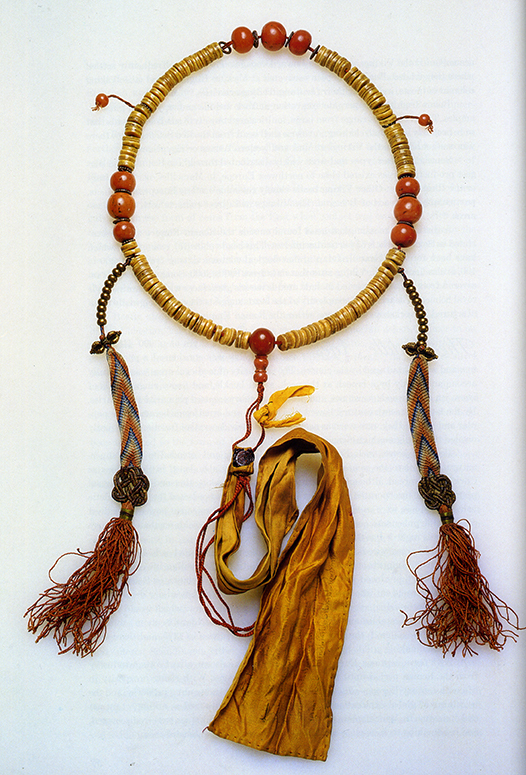 This sort of jewellery is in wide use throughout the western and eastern sub-Himalayan area by tribes who follow Buddhism and others who emulate them, though the local term used to designate it varies with the group. 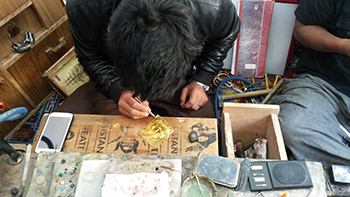 The origin of the charm container-pendant in Tibet can be traced to the often inhospitable environment. 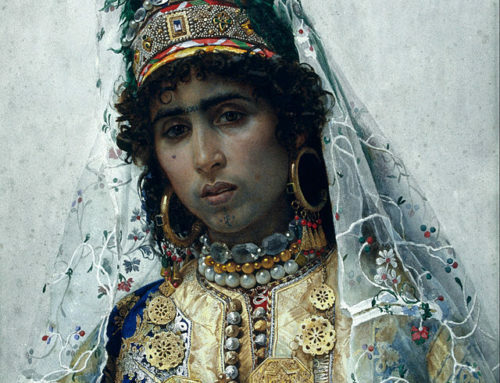 Violent natural phenomena, such as seasonal floods, hail, wind and sandstorms affect the success of the crops upon which the people’s very existence depends. 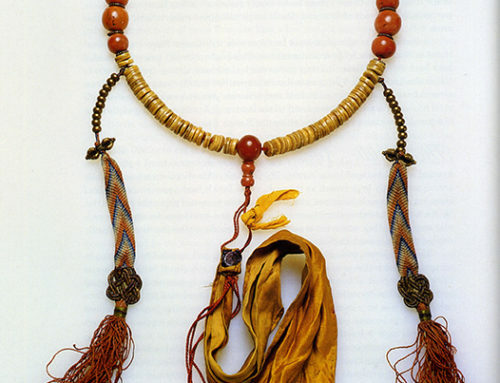 The use of protective charms and amulets, which were already used before the arrival of Buddhism, were meant to protect against this natural disasters. Almost every man, women and child in Buddhist Tibet and the Himalayan area of India carries a variety of charms and amulets on them. It is essential that the charm is in physical contact with the body. 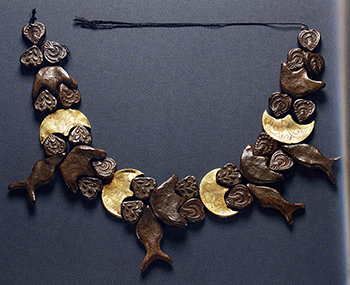 The ga’u is a complex of form, function and symbolism. It can be of copper, brass or bronze, or a combination of these. 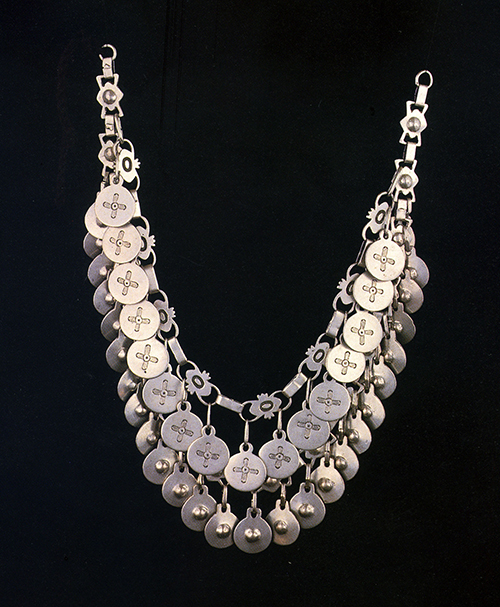 Many are made of silver which may be used for the entire object, or only its visible front, in which case the back half is usually copper, brass or iron. 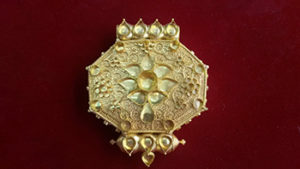 Tibet is rich in gold and those who can afford it have their ga’us made of that precious metal. Because a ga’u functions as a container to hold the various charms placed within, they consist of two basic parts that fit together, so the access to its inner space is possible. The most common ga’u content are handwritten or printed charms, chosen for specific purposes and adapted to the wearer’s need. Objects believed to have magical virtues can also be placed inside. Whatever its form, a charm is inert and powerless until it has been consecrated by a lama. 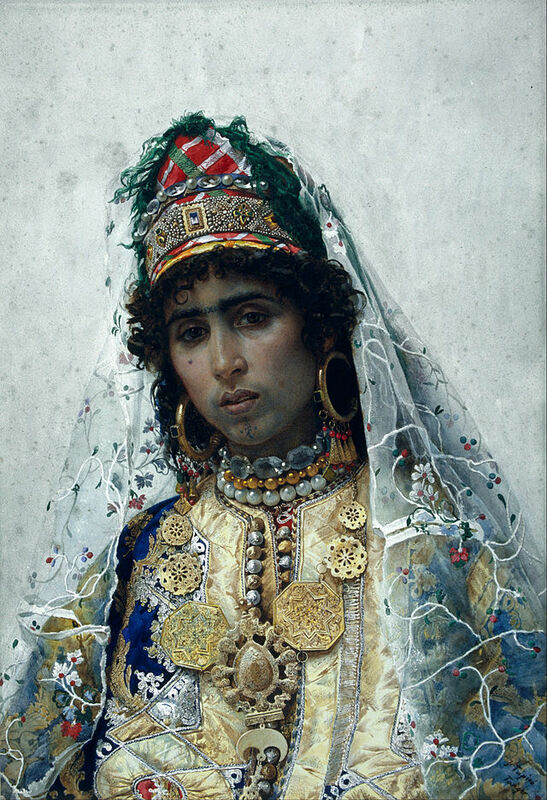 At the same time, should it ever become necessary to sell a ga’u, all of its contents are removed and saved, and the seller rubs the ga’u on his/her body to return him/herself the spiritual good luck it contains, and a small recitation ceremony may be performed. 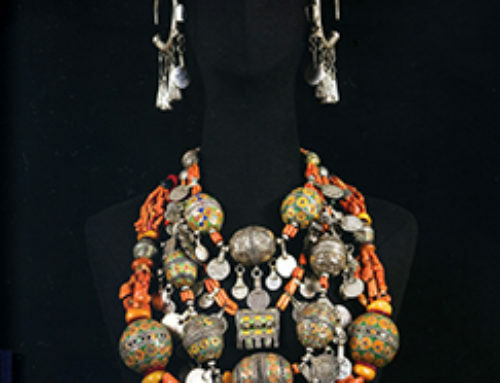 Traditional ga’us form can be classified according to their basic shape, some of which are regionally distinctive. 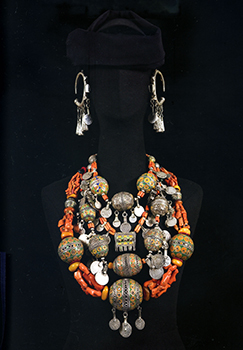 In Ladakh, besides using the forms that are typically Tibetan, women wear a necklace consisting of a series of miniature, backless ga’us of double-sided-ogee and oval form (see picture). 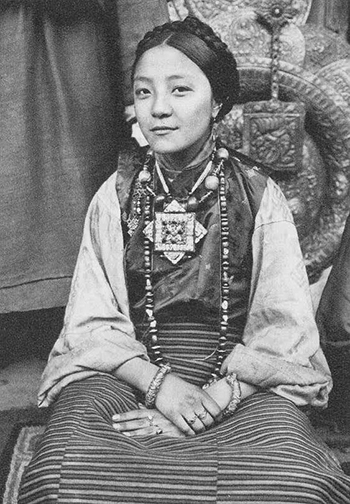 In central and western Tibet women show a preference for the square, some with projecting points on all four sides. The size can range from small to enormous. 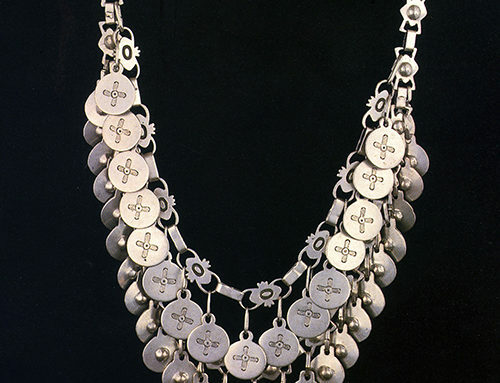 No matter what the ga’u shape, its top is provided with either a single tube or one made in three parts from which the ga’u is suspended together with many beads. At the bottom of most gau’s is usually found a double-ended facet pointed appending form that symbolizes the diamond thunderbolt (dorje), Many books in which illustrations of ga’us appear, show them, incorrectly, upside down with the dorje at the top. 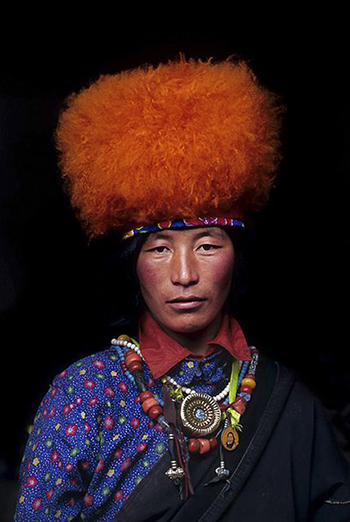 Other type of ga’us are the small ones worn by high rank official in pre-chinese Tibet, fixed in their hair-plaites topknot. Some children have them attached to their bonnet for protection against illness. Some other bigger ga’us are used when traveling as portable shrines and hang from the shoulder instead that from the neck.